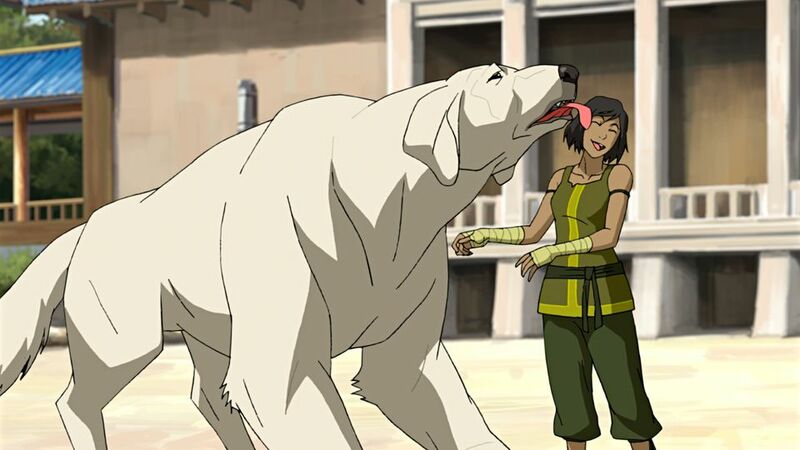 After last week’s pretty bleak ending, it was nice to see a warm reunion between Korra and her loyal polar bear dog companion Naga. Korra is greeted by Bumi, Pema, and her mentor Tenzin. Tenzin waits no time to ask about the invasion at Zaofu and Korra regretfully breaks the news of defeat. Korra also has a hugely anticipated reunion with both Asami and Mako over dinner. It’s really heartwarming to see the trio come back together, but given the love triangle in past seasons, things did feel a bit awkward, especially when Asami let it slip that Korra had contacted her and not Mako or Bolin. It was really great to see these characters finally come back together after so much time had passed, but I must say having Prince Wu around was a bit obnoxious(which was the point). Wu makes for an interesting foil for Mako, but by now, he honestly seems like a pretty pointless character. Despite these three having great history together, there’s a fair amount of tension between Mako being out of the loop and Korra telling Asami not to trust her father as he tries to make amends for his mistakes. After blowing up the Kuvirapiercer last week, Bolin and Varrick have found themselves lost in the woods on their way to Republic City. It’s not the most important subplot this show has ever seen, but we do get to see some really fun banter between the duo. Varrick continues to realize that Zhu-Li was the greatest assistant in the history of….well…ever. Eventually the two fall into a trap and are captured by benders who had escaped from Kuvira’s “re-education” camps. There’s a pretty humorous tension that crops up when Varrick declares that they were members of Kuvira’s inner circle(just as the escapees were essentially raising their pitchforks). Eventually the duo decides to help these wayward benders take down the re-education camp housing even more “fugitives”. This storyline was a neat way to create some tension and cool action sequences, but it really didn’t do much to further the story. It only continues to cement that yes, Kuvira is more like Hitler than we may have realized. She is quickly sliding away from admirable villain with a notable cause to a mustache twirling monster hellbent on controlling the world(she’s trying to build a super weapon and I promise it isn’t to protect the Earth Kingdom). I suppose it’s a natural direction to take her as a villain, but I’m becoming even less interested in that character. In the opening episodes, I actually believed in her cause and thought she had a point, but it’s becoming clear that her motivations aren’t quite as grounded in humanity as I expected. It’s heading in a fairly predictable and less interesting direction, but I’ll hold out faith that the final stretch of episodes will bring in new angles. Prince Wu can’t seem to stay put during dinner and wanders to the bathroom where he is knocked out and kidnapped. Eventually Korra, Mako, and Asami notice he’s been gone and start looking for him. Korra spots him in a truck jut before it jets off. The trio follow for a really intense chase that leads them to the train station. The three end the merry chase with some old fashioned bender on bender dueling very reminiscent of Book 1’s finer moments. Impressive dueling sequence aside, I think the big take away from these scenes is Korra’s ability to find Wu via the earth bending technique she learned from Toph. Until this moment, I hadn’t felt like Toph’s training had really done much so it was nice to see Korra reveal that she had learned a few tricks. After rescuing Wu, Mako decides its best to hide him while Asami, Korra, and he plan their next move. He takes Wu to one of Asami’s mansions where Mako has also been housing his family since the fall of Ba Sing Se in Book 3. This storyline may not have done much to kick the plot into high gear, but it was really exciting to see three members of Team Avatar back in action like the old days. There’s a great deal of nostalgia written into this whole scenario and it just works. It seems rumors of the super spiritual swamp powers reached Kuvira. Bataar Jr. and Kurvira march into the swamp and decide to start chopping limbs off of the big tree(think Eywa from James Cameron’s Avatar). It looks like she just can’t wait to get her doomsday device under way. Reunion isn’t the strongest episode of this season and actually seems like an oddly placed piece of filler shoehorned in just six episodes from the series finale. It does a great job at capturing the warm yet uneasy feelings these characters all have now that they’re all coming back together. Even though they are all still friends, they’ve all changed and the adjustments won’t be easy. Varrick and Bolin’s misadventure through the woods on the way to Republic City really doesn’t amount to much. We got some cool action beats, but this side trek is one better left off the books as we head into the final stretch of episodes. One major criticism I have of Book 4 even more apparent in Reunion is the lack of clear direction for the overarching story. We are only six episodes from the end of the series and the story still lacks a confident stride we’ve seen in past seasons. What we’ve seen so far has been great, but up to this point there’s been no clearly discernible beat the story is marching to. This fact is even more noticeably prominent when the story is running in place as it does in Reunion. Next What’s the Big Deal with the Star Wars Teaser?